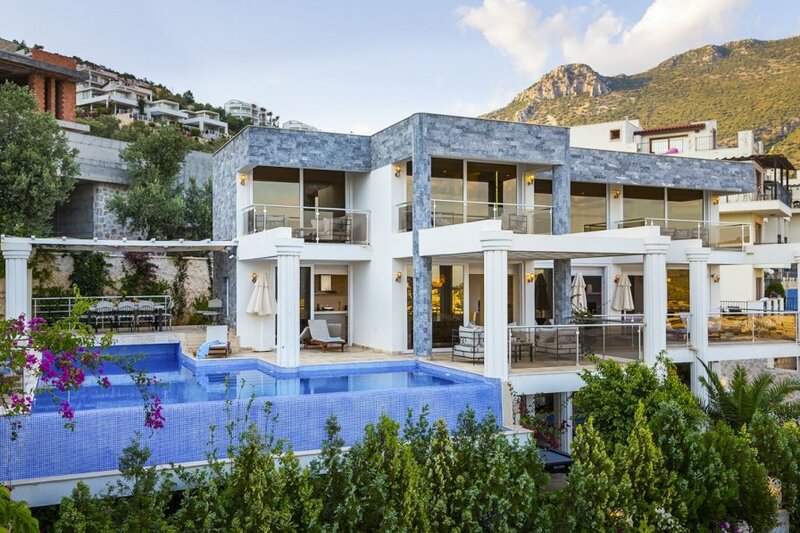 Just a short twelve-minute walk from the centre of vibrant Kalkan town and five minutes from the nearest local restaurants is where you'll find five-bedroomed Villa Pilanta. Just a short twelve-minute walk from the centre of vibrant Kalkan town and five minutes from the nearest local restaurants is where you'll find five-bedroomed Villa Pilanta. Its considerable lures include a gym, private outdoor infinity swimming pool and a master bedroom with a luxurious free-standing Jacuzzi bathtub. Set in a private and peaceful spot, this is Turkey at its most magical. To say that the villa is spacious is an understatement. The first floor has a modern open-plan lounge, kitchen and dining room. Full-length sliding glass doors and windows cover the front of the property, affording fantastic views of the Mediterranean Sea and majestic pine tree-lined mountains. The paved pool terrace can be accessed from this level, and it's where you'll find the private pool, outdoor dining area and spacious sunbathing terrace dotted with several cushioned loungers. As well as a pool terrace, the villa boasts a private garden below with a covered dining area, pool table and table tennis to keep all the family entertained. Inside there's a double bedroom with en-suite bathroom, the gym, and living and utility area and a separate bathroom. There's also another double on this level – dialling up the glamour with its en-suite facilities plus free-standing Jacuzzi. The second floor comprises the remaining three bedrooms: two doubles and one twin, all with stylish en-suite bathrooms and sea-view balconies. The master bedroom steals the show with its raised, decked area with a sink and free-standing Jacuzzi bathtub. A large private balcony and floor to ceiling glass windows allow you to soak up the mesmerising vistas, morning and night effortlessly. The villa is nestled into the hillside, surveying the picturesque landscape below. Take a short stroll into the centre and wander through the cobbled, boutique-lined streets. Stop off at one of the famous roof-top or waterfront restaurants at the harbour for international or traditional cuisine. With sandy beaches and more historic sites in the area too, it's the perfect base to go exploring. Note:Some of the photos may be of the neighbouring Villa Onluk, both villas area the same style and designer. Note: an additional bedroom, sleeping 2 will be added to the 2nd floor for the 2019 season. We are awaiting photos before we add details of this. Kalkan was once a quiet fishing village and has since turned into a popular holiday destination. It still retains its classic Turkish charm with traditional restaurants serving everything from fresh seafood to fish mezes and colourful fishing boats still lining the harbour. You can even jump on an authentic wooden gullet to explore the surrounding bays. The boats usually stop for snorkelling and swimming in the calm crystal-clear waters and lunches are sometimes prepared on board. You can't come to this beautiful part of Turkey without exploring the many Lycian sights in the area, such as Xanthos, Patara, Myra or the sunken city of Kekova where there are ancient 2nd-century ruins. You can get to Kekova via an organised boat or kayak trip. Boats usually leave from Kas, a lively town which is a 30-minute drive from Kalkan. Kas also has more to offer with its impressive ancient site of Antiphellos, with still-visible ruins including a theatre. For more fun day trips, you could head to the seaside resort town of Fethiye, a one-hour drive from Kalkan. It has plenty of top-notch restaurants, shops and fascinating cultural sites too that are well worth a visit. Back in Kalkan itself, you can immerse yourself in the culture and head to a market. You'll find everything from spices to hand-crafted rugs, fresh produce and jewellery. The town is also famous for its waterfront cafes and roof-top restaurants offering fantastic views of the bay. For days spent by the beach instead, Kaputas Beach and Patara Beach, a long stretch of shoreline that's also a National Park are both excellent choices. With day beach clubs at both, you can relax on the sand, take part in water sports like kayaking and parasailing or eat at the restaurants.